Blizzard translated Daughter of the Sea to other languages, and it will give you chills! 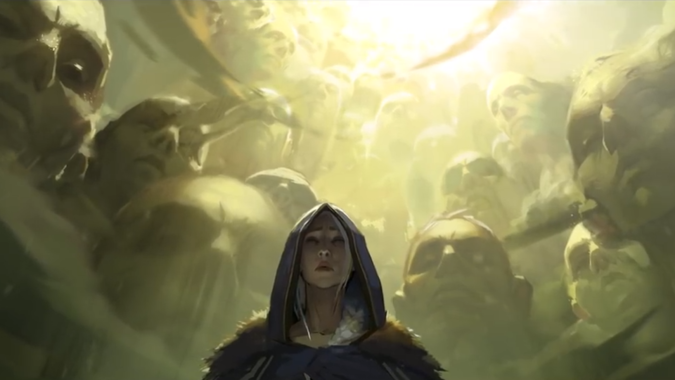 The World of Warcraft short Warbringers: Jaina came out just a week ago, but already it’s my favorite lead-in content for an expansion, since ever. A wonderfully sung sea shanty that commands your attention and gave me shivers down my spine when Jaina looks at the screen and says “beware of me.” I must have listened to it fifteen times a day since it came out. A song hasn’t captured my ear like this since I listened to the Hamilton soundtrack. Imagine my shock and joy when I realized that there were fourteen regional versions! It’s not new for a company the size of Blizzard to release trailers in other languages for a worldwide market. What you are less likely to see is re-recording a musical number with local actors and choirs. This is definitely a step above the rest! We have gotten fourteen more versions of this wonderful song thanks to this. The localization teams made sure during translating that the lyrics still convey the same thing in the new languages. Not content to stop there, The Russian version of the song features a choir made up of actual sailors, who were shipping out the day after recording the song! A big round of applause and recognition for all the regional Blizzard offices is well deserved. I have to say that the French and Russian ones have become my favorites. The Russian chorus has a great lost sailors in a watery grave feeling. While the final line in the French version changes “beware of me” into craignez-moi, or “fear me!” and the actress, Nathalie Homs, delivers it so hauntingly I almost rolled another Mage right on the spot. With Battle for Azeroth coming in just a few weeks we’ll be able to hear it in game from sailors in Kul Tiras, I know I’ll be tempted to change my language settings. Which version did you like the best, let me know below!